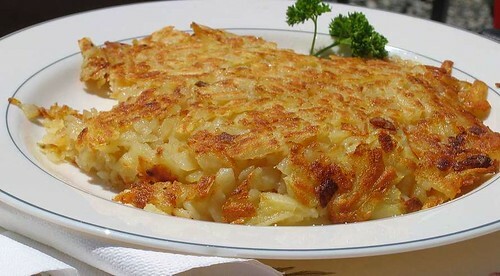 Roesti (read other things about roesti) or Swiss hash browns, is a traditional Swiss dish which is mainly made of potatoes and was once eaten mostly in Bern but is now served all overSwitzerland. It often is used to accompany spinach and fried eggs. To make you will need 1 pound large baking potatoes, 1 tablespoon salt, 3 1/2 ounces smoked bacon, thinly sliced, vertically, 3 1/2 ounces onion, diced, 1 sprig thyme, 3 1/2 ounces mushrooms, diced, 2 tablespoons oil, 2 ouncesbutter, and 6 slices Gruyere. To prepare boil the potatoes in their skins for 20 minutes, drain, and cool and peel. Use a cheese grater to grate them into a large mixing bowl and add salt. In a frying pan, sauté the bacon and onions, add the thyme leaves and mushrooms and cook until soft. Combine with the potatoes and mix being careful not to mash them too much. Heat oil in a frying pan and add 3 or 4 spoonfuls of the mixture then use a spatula to flatten. Brown it over a high heat. When the bottom side is cooked flip it over. Repeat with remaining potato mixture. Place 1/2 tablespoon of butter and a slice of Gruyere on both sides and melt under a hot grill.